Utz Rachowski, a distinguished voice in contemporary German literature, will give two presentations to the SFA and Nacogdoches communities on SFA's campus. Rachowski's first presentation, "The Poet as Political Prisoner: Personal Experiences in a German Dictatorship," will be at 5:30 p.m. Monday, April 9, in Dugas Liberal Arts North, Room 102. His second presentation, a bilingual poetry reading alongside Dr. Scott Shattuck associate dean of the College of Fine Arts, will be at 5:30 p.m. Tuesday, April 10, in Dugas Liberal Arts North, Room 142. NACOGDOCHES, Texas - Hosted by Stephen F. Austin State University's Department of Languages, Cultures and Communication, Utz Rachowski, a prominent voice in contemporary German literature, will give two presentations to the SFA and Nacogdoches communities on SFA's campus. Rachowski's first presentation, "The Poet as Political Prisoner: Personal Experiences in a German Dictatorship," will be at 5:30 p.m. Monday, April 9, in Dugas Liberal Arts North, Room 102. His second presentation, a bilingual poetry reading alongside Dr. Scott Shattuck associate dean of the College of Fine Arts, will be at 5:30 p.m. Tuesday, April 10, in Dugas Liberal Arts North, Room 142. Rachowski, whose writing deals with the oppression in the former German Democratic Republic known as East Germany, was arrested in 1979 for "subversive agitation" for distributing his own poetry as well as texts from other well-known dissident writers of the time. Rachowski remained in prison until 1980, when he was released from an East German prison through the help of Amnesty International. He then relocated to West Germany where he studied art history and philosophy in West Berlin. Since his release, Rachowski has been a freelance writer of prose, poetry and radio plays. 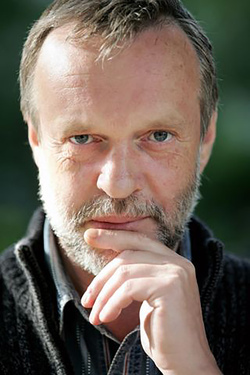 He was co-editor of the literary journal "Ostragehege" from 1993 to 1999. Since 2003, he has worked part time with the Saxony State Commission for the Stasi Files to help provide rehabilitation counseling to victims of the East German dictatorship. Rachowski has published 15 books, including short stories, essays and poems, which have been translated into English, Polish, French, Spanish, Serbian and Finnish. He has performed readings of his works throughout Europe, the United States and parts of Africa. He also has received numerous awards from around the world for his work. Dr. Louise Stoehr, SFA associate professor of German, is thrilled to have Rachowski present at SFA. She believes that having a distinguished author such as Rachowski is a significant opportunity for the community. "Utz Rachowski is a representative of the first generation that was 'born into' the former German Democratic Republic," Stoehr said. "He did not set out to be a representative voice of the young dissident poets of the time. Today, Rachowski is considered one of the foremost voices of his generation, as his writing seeks to come to terms with the difficult past in the former East Germany." Both presentations are free and open to the public. For more information about the events, contact Stoehr at lstoehr@sfasu.edu.